Continuing a strong commitment to introduce design methods to improve project delivery schedules, Andrews Architects has been a long-standing proponent of modularization. With projects ranging from affordable in-fill homes to assisted living facilities, our firm has designed modular structures for over twenty years. We are credited with designing the largest single story I-2 modular building in the State of Ohio. At over 42,000 SF, the 60 room assisted living plus memory care facility was completed in less than twelve months utilizing the speed of placing over thirty factory built modules on foundations. 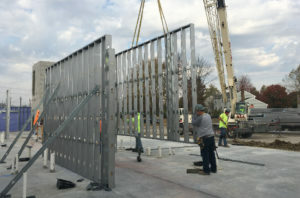 This delivery technique requires extensive pre-fabrication coordination between the module producer, site contractor, and design team. Operators that plan to construct the same building on multiple sites may best benefit from this approach. In fact, Marriott is utilizing this approach for a line of its motels in California. We have also designed multi-story senior living projects that benefit from the speed of panelization techniques. Depending upon the project’s use group, panels of either wood or metal stud framing are fabricated in climate controlled conditions, shipped to the site sequentially, and assembled by experienced set crews. Elevator shafts and stairways are also fabricated in panels off-site, avoiding time and weather delays associated with constructing masonry shafts. We have designed a 90,000 SF two story SNF + AL project utilizing metal panels that improved the schedule by two months. This method can be particularly beneficial to schedules when facing an autumn or winter construction start. To take full advantage of this panelization, the owner and design team need to commit to the technique at the onset of design to properly detail the bid and permit documents. We are also working on developing hybrid methods. Combining panelization for the first story of a building with placing modules on subsequent upper floors holds a lot of potential for urban infill projects where laydown space is at a premium (or non-existent). Thorough planning with all members of the design, fabrication and construction team are paramount to assure that the speed associated with this approach can be fully realized.